Gabon is sub-Saharan Africa’s fourth largest producer and exporter of crude oil. 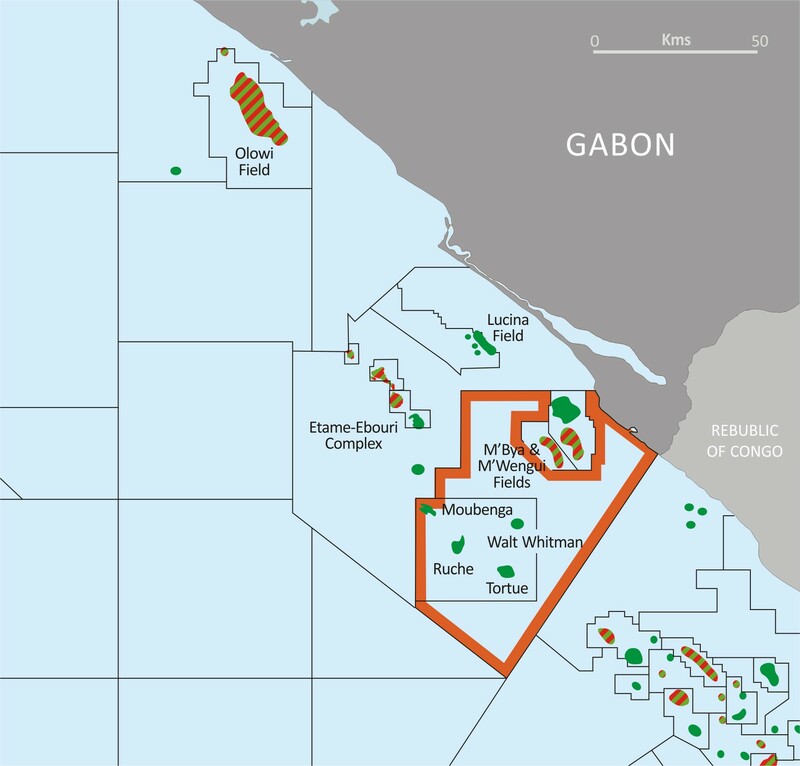 The Dussafu Marin Permit is a Development and Exploitation license with multiple discoveries and prospects lying within a proven oil and gas play fairway within the Southern Gabon Basin. To the north west of the block is the Etame-Ebouri Trend, a collection of fields producing from the pre-salt Gamba and Dentale sandstones, and to the north are the Lucina and M’Bya fields which produce from the syn-rift Lucina sandstones beneath the Gamba. Dussafu is operated by BW Energy Gabon and Panoro’s current interest in the license is 8.33%. There are five oil fields within the Dussafu Permit: Moubenga, Walt Whitman, Ruche, Ruche North East and Tortue. The latter three fields were discovered by Panoro and JV partners in the last 7 years. The development of the Dussafu fields now is underway, with production from 2 wells at the Tortue field having started in September 2018. Oil is produced from the Gamba and Dentale reservoirs at Tortue into a leased Floating, Production, Storage and Offloading (FPSO) vessel via subsea trees and flowlines. Production is currently in the middle of the range of 10,000 to 15,000 barrels of oil per day. Phase 2 development activities are planned for 2019 and 2020 with up to four additional development wells to be drilled at the Tortue field. The exploration potential in Dussafu is significant and interpretation of recent 3D seismic data has confirmed several large Dentale prospects and numerous Gamba prospects in addition to the already discovered resources. Certain of these prospects will be targeted in the planned 2019-2020 drilling campaign. Tullow Oil Gabon S.A. a subsidiary of Tullow Oil plc, holds a 10% back-in right under the terms of the Dussafu PSC which is exercisable within a certain time after first oil.